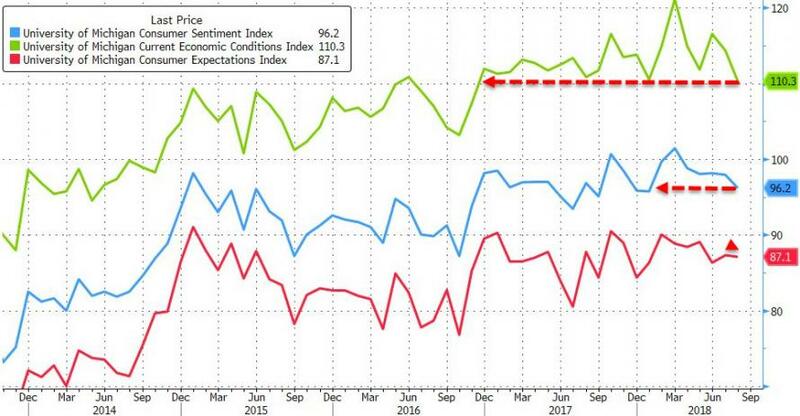 Following the preliminary data's weakness (11-mo lows), the final August University of Michigan Sentiment Index improved modestly (from 95.3 to 96.2) but still the weakest since Jan 2018. 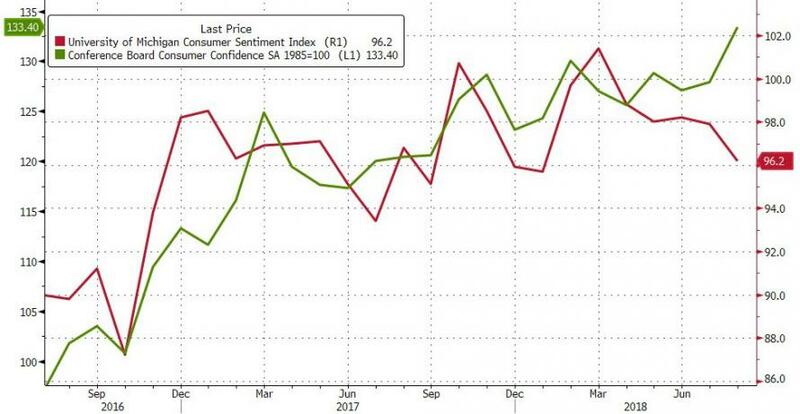 As UMich's Richard Curtin notes, most of the August decline was in the Current Economic Conditions Index, which fell to its lowest level since November 2016. These results stand in sharp contrast to the recent very favorable report on growth in the national economy. Consumers’ views of buying conditions have fallen to multi-year lows. 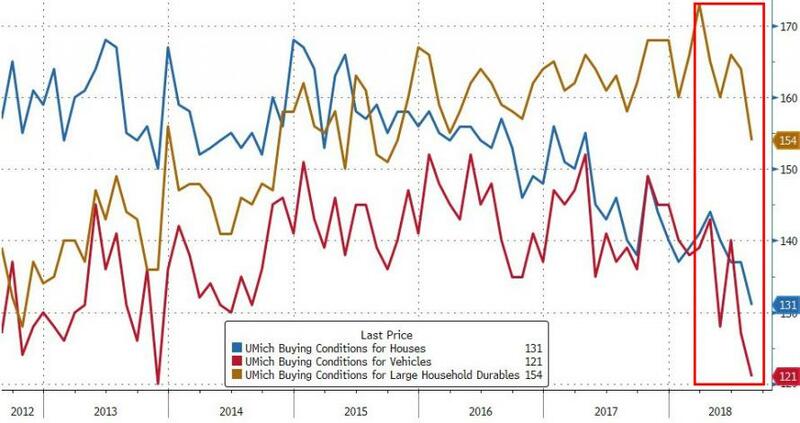 Buying conditions for household durables were viewed less favorably than since late 2015. The dominating weakness was related to less favorable assessments of buying conditions, mainly due to less favorable perceptions of market prices and to a lesser extent, rising interest rates. Future income and job certainty have become the main reasons cited by consumers for their positive spending views. 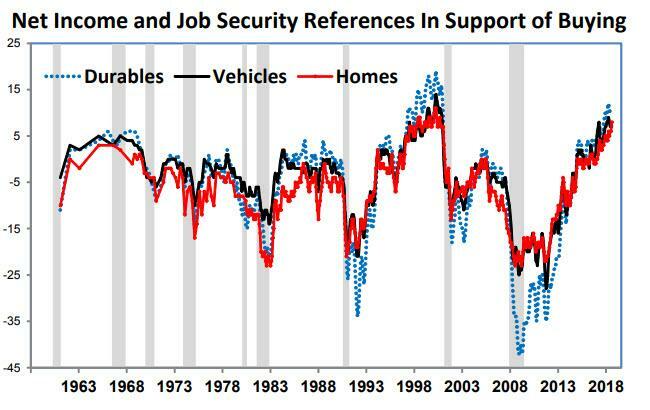 This shift from attractive prices and interest rates to income is typical of the later stages of expansions, with references to income and job certainty peaking just before downturns. The anticipated inflation rate has also increased to its highest level in four years.